We are often asked how our prices for our full mouth dental implants compare to the price of other implant dentists, periodontists, and oral surgeons. Our patients tell us our Alternative To all on four® and all on six fees are 30 to 50 percent lower than what other dentists charge. There are many hidden fees, which affect the final price of implant reconstruction. These may include the types of materials used such as porcelain vs plastic on titanium. Prospective patients find our fees very reasonable and lower than most dental implant costs found in other dental offices. We have been practicing dental implantology for a very long time. We are a single location advanced dental implant center, located in the Tri State Area for 43 years. Our doctors are all former Dental School professors. We have multiple specialists and general dentists under one roof so that all of your dental implant reconstruction from surgery to final teeth can be fabricated at one location. This not only saves the patient time, but also contributes to our low dental implant costs. If you go to Google us, you will find the results will speak for themselves. The reputation of placing so many implants over so many decades leaves a trail on the internet, and we are confident when you do your research on Dentists, you'll feel comfortable with Dr. Kurpis and his dental implant team. We look forward to having the opportunity to helping you with your dental implant needs and hope that you join our large family of patients from all over the country who have chosen Dr. Kurpis for their dental implant reconstruction. 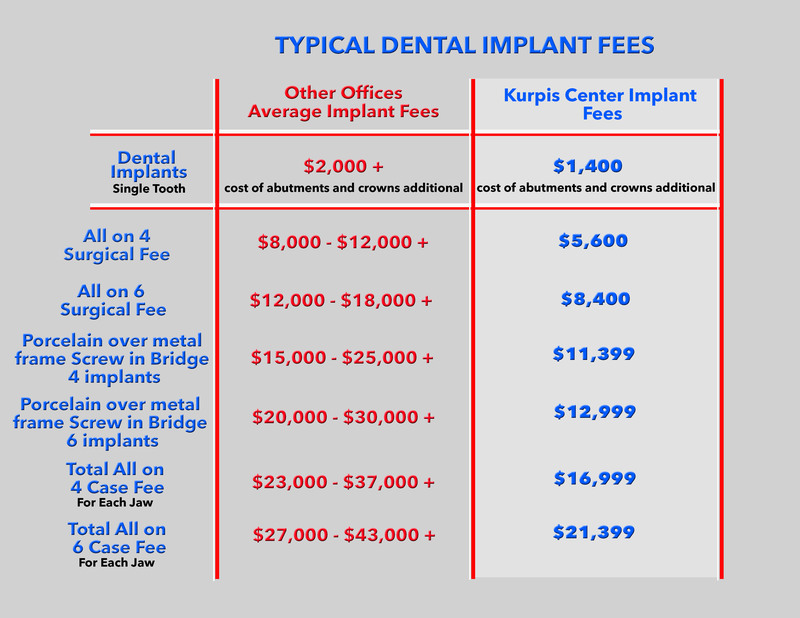 Here is a typical breakdown of our dental implant fees vs other dental implant offices across the country. © TheImplantDentist.com All rights reserved.